Authentic Geek! : First Look At 'Green Lantern' Movie Costume or "Close, Not Quite, But Close"
First Look At 'Green Lantern' Movie Costume or "Close, Not Quite, But Close"
There ya' go! 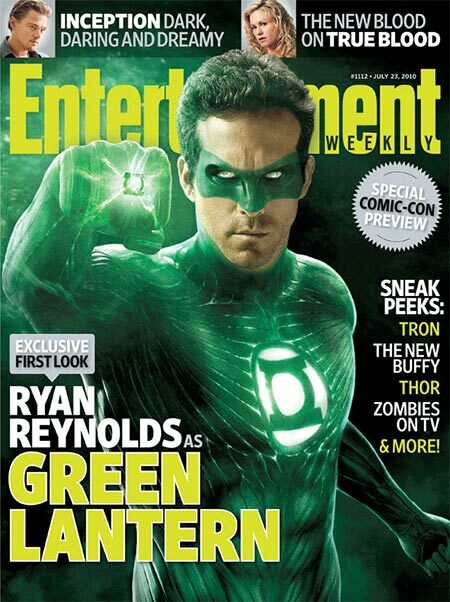 Your first look at Ryan Reynolds as Hal Jordan, Green Lantern of Space Sector 2814. That's right, it doesn't look any thing like the comics. Not that we could have expected them to "actually" make it look like the comic. And I know they probably want to make it look all 'sci-fi' and 'organic' and what not. And I also know that in the comics, not every Green Lantern has the same union suit. I'm not saying I hate it. Not in the least. I am reserving judgement until I see the trailer. I suppose I should be grateful they didn't base the design of Guy Gardner's GL uniform, which has my vote for "Worst Costume Ever". Well, it's tied with the 'Road Warrior' armor the Mighty Thor sported for awhile in the late '90s. I agree completely. I just find it off putting that the suits looks like it's made of green licorice strips. Hahahaha!